IDAS LPS-D2 50,8mm filter is the best choice to reduce light pollution for long-exposure astrophotography and keeping a very good color balance both with DSLR (also astro modified models) or cooled CCD/CMOS color cameras. This 50,8mm model can be screwed to any 48mm diameter thread (like the one in front of the photo adapters). LPS-D2 filters are the evolution of previous IDAS models, they blocks main emission of LED and sodium lights and they offer a better color balance than other filters brands. Light pollution is a big problem also for astrophotography. To reduce light pollution, it is possible to use special nebula filters that often do not create images with colors correctly calibrated when used with DSLR (also astro modified) or cooled color cameras. The IDAS filters are specially designed for astrophotography and, in addition to reducing light pollution and increasing the contrast of objects, keep a correct color balance. Light pollution suppression (LPS) filters are designed to suppress the common emission lines generated by artificial lighting, yet allow the important nebula emission lines to pass, thus enhancing the contrast of astronomical objects, particularly emission nebulae. 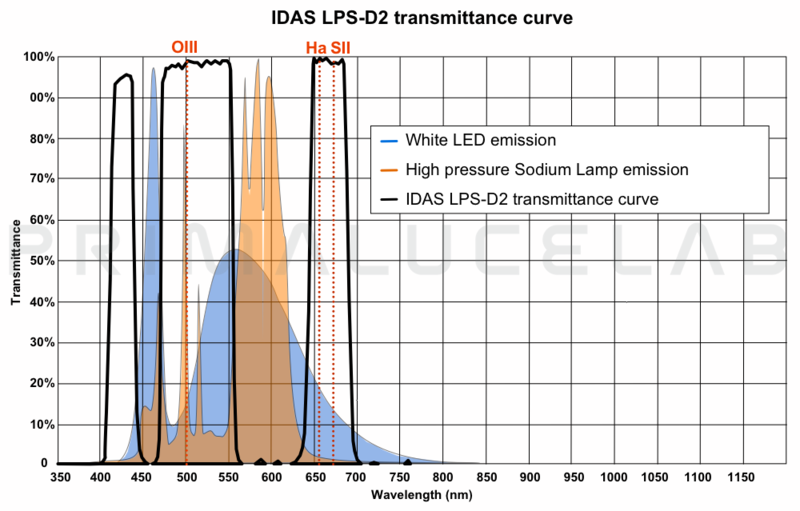 Unlike other light pollution suppression filters, IDAS filters are specifically designed for balanced color transmission using the IDAS unique Multi-Bandpass Technology (MBT) process. The balanced transmission allows color photographs to be taken with minimal color cast to broadband emission objects such as stars, galaxies and globular clusters. The comparison photos at right demonstrate (qualitatively) that the IDAS filter maintains better color balance than other filters which have been designed for visual use. LPS filters utilize the unique IDAS Ion Gun Assisted Deposition (IGAD) coating technology for superior coating durability (quartz hardness) and safer cleaning. IGAD coatings also improve temperature and humidity stability of the filter performance, reducing spectrum shifts down to +/-1nm from the +/-3 or 4nm shift of standard coatings.